Concordion assertFalse command is used when the fixture needs to know the expected result in order to perform a test. 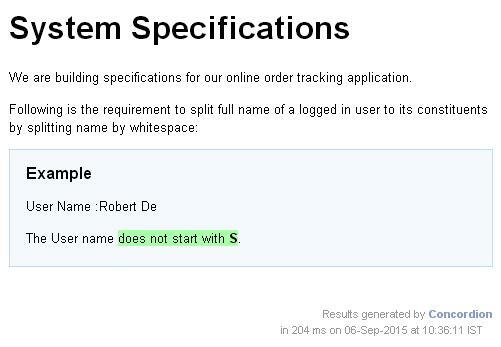 The User name does not start with S.
If we want a test to be executed on the User Name and check that the user name does not start with S.
When Concordion parses the document, it will set a temporary variable #userName to be the value "Robert De". Then, it will check if the userName starts with the letter specified by #letter variable set in next command. 2 Add the required Concordion libraries using Add External JARs option as explained in the Concordion - First Application chapter.